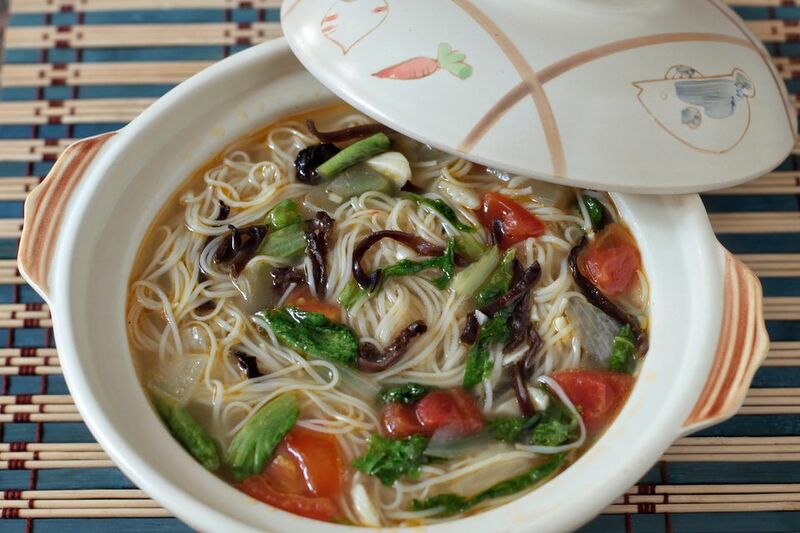 The Chinese New Year longevity noodle dish, misua (miswa or mee swa) is served during festivities (including the Chinese New Year) and special occasions (like birthdays) in China, Singapore, Malaysia, Indonesia, Vietnam, the Philippines, and Taiwan. What is misua? It is a thin wheat noodle that takes around five minutes to cook. Cook the misua longer and the starch will thicken the soup while the noodles turn soggy. As sold in Asian groceries, misua comes in coiled bundles. The noodles swell tremendously during cooking so, as a guide, use one bundle to serve two. Heat the peanut oil in a pot. Saute the minced garlic, sliced shallots and diced tomato just until softened. Add the sliced wood ear mushrooms to the pot. Pour in the chicken broth and bring to the boil. Add the misua and greens. Season with fish sauce, black pepper, and oyster sauce. Let boil for two to three minutes or until the noodles and greens go limp. Turn off the heat. Cover the pot and allow everything to finish cooking in the residual heat for another two to three minutes. Taste the broth. Adjust the seasonings, if needed.